Features 1.The backpack purse has a USB charging port, with a power bank you can reload the phone from your same hand, the only thing that you have to do is connect your power bank on the portal USB that is in the backpack, then out connected a USB cable long, and finally you can use your phone while walking and charge. It is available for easy use is on those days you are away from home for hours on end. 2.Comfortable and practical. It represents a unique exclusive and modern design. Top zipper closure makes the backpack can taking in or out easily. 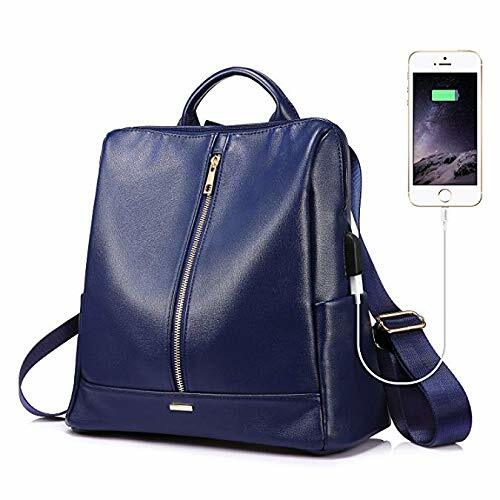 Also ideal for those who are rush to go to the office or studying the last minute for an exam, or just have easy access to load the cellphone or tablet. Product Information Brand: LOVEVOOK - Pursuit for Fashion, Offers Young Girls and Women with Stylish and Affordable Handbag Purse. Material: High quality synthetic leather Closure Type: Zipper Color: Black/Blue Style: Backpack/Shoulder bag/Coin purse Occasion: School/Shopping/Work/Daily life/Dating/Travel/Vacation Gender: Women and Girls Remarks 1.Little smell is normal, putting it outside for few days, the smell will disappear. 2.Please allow little color difference due to different camera or light environment. 3.Please confirm the size according to our description instead of the product image.